As mentioned in my previous post I took it as my mission to taste as many of Boston’s food trucks as I could. On Sunday I walked all the way to the South End to SoWa Market – a big market that takes place every Sunday. 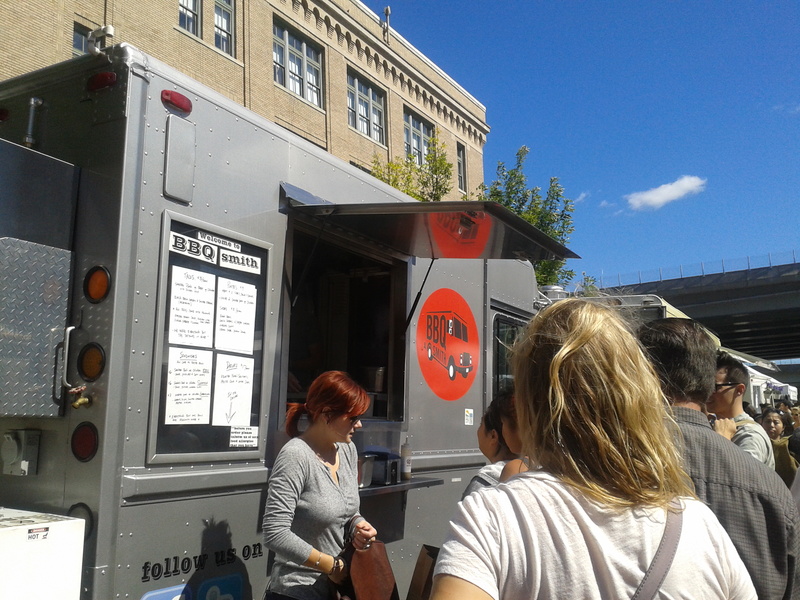 I quickly moved to the food truck section which was already crowded with hungry Bostonians. I started my lunch with a pork taco at BBQ Smith. 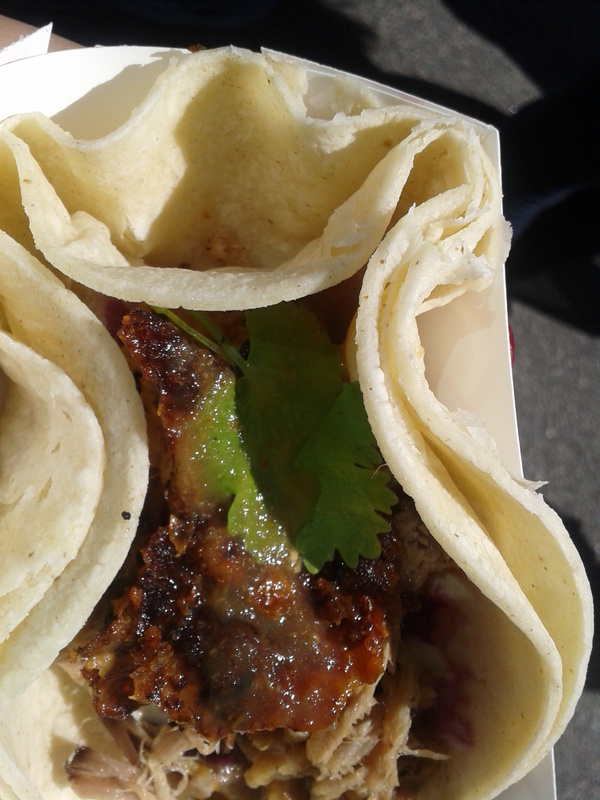 For $3 you got a taco filled with crispy and smoky pulled pork topped with avocado salsa and a spicy sauce. This was incredibly tasty and a really good start to my lunch. 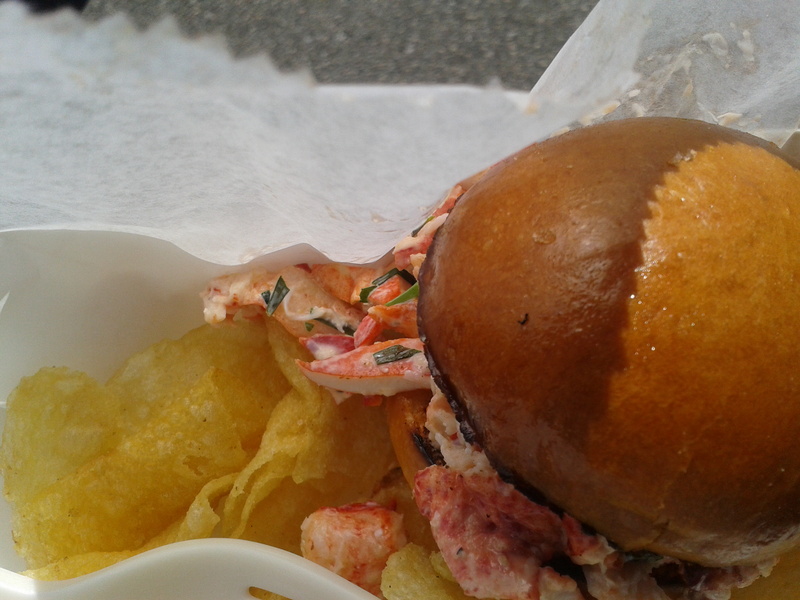 They also had really good looking sandwiches but I had to save my stomach for my next truck: Lobsta Love. Lobsta Love’s lobster slider was all that Chowda’s slimy lobster roll wasn’t: fresh, not drowned in mayo and made to order. The lobster was mixed with mayonnaise and tarragon but kept its strong flavour. The brioche bun was lightly toasted and seemed to be brushed with butter and was the perfect accompaniment to the lobster. Lobsta Love offered many lobster options including a lobster mac and cheese which I will absolutely have to try before I leave Boston. 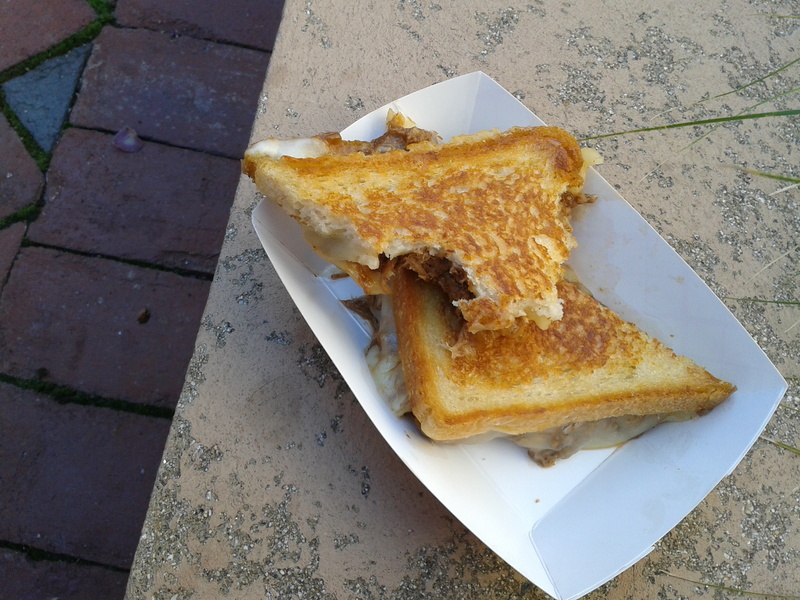 By this point I was pretty full but could not leave before trying famous cheese melts from Roxy’s Gourmet Grilled Cheese. Roxy’s Gourmet Grilled Cheese are a bit of food truck royalty as they have won many prizes and have taken part on the Food Network’s Great Food Race, so I knew I was in for a treat. I thought I might as well go all out so I went for the Mighty Rib: Fontina cheese, braised back ribs and caramelised. Yes, ribs, in a cheese toastie! After 20 minutes waiting with other 50 people the beast finally came out. It looked glorious, all cheese and and pork amazingness. This toastie completely changed my idea of what cheese toasties should be and I am definitely recreating this at home. The only thing missing was a bit of spice like some sliced jalapenos or a salsa I could dunk the toastie in. Aside from that…fatty perfection! All I can say is that Boston is a great city if you like food! Now I can’t wait to go back to London and explore the food truck options there. After the disillusion of Chowda’s lobster roll I took it to my online bible of American food – Serious Eats – to find some tasty food for my next few weeks in Boston. 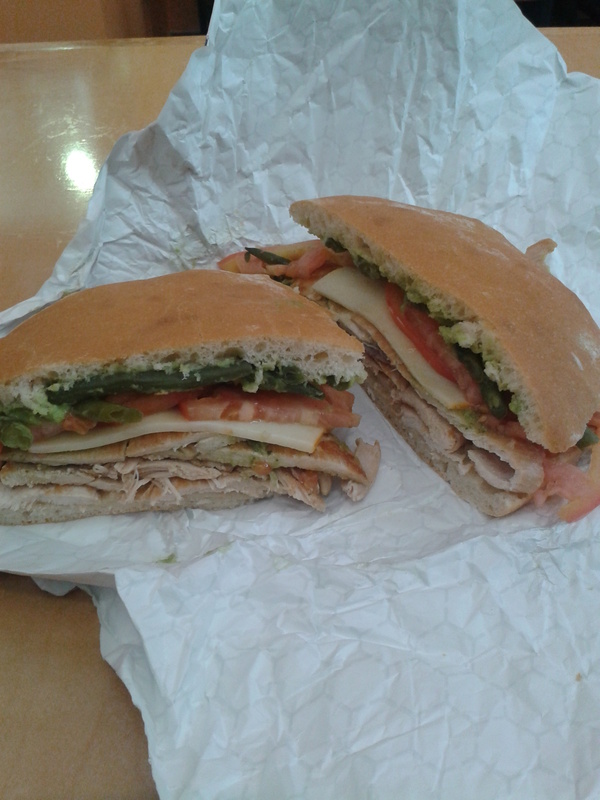 I began my search for a place to have lunch around my office – Downtown Crossing – and came accross Chacarero’s, a small place that serves enormous Chilean sandwiches called Chacarero’s. I came back to the office and quickly messaged Miss Meatball to tell her about one of the best sandwiches I had ever had. This thing was gigantic and so so good. It’s basically and white homemade bap, smeared with avocado, topped with your choice of beef, chicken, or both (I tried chicken but really should go for both next time), munster cheese and then runner beans (yes, runner beans), tomato, lettuce, and an incredible mistery green spicy sauce. All the ingredients were incredibly fresh and every sandwich was made to order. A large chacarero came to 8 dollars (that’s roughly 5 pounds) which fed me for both lunch and dinner (it is a really big sandwich). This made me think about the amount of times I had a horrible sloppy sandwich from Pret or worse, Sainsbury’s, simply because there are no other affordable options around (read Holborn). If only I could have walked five minutes from LSE and pay five pounds to have a gigantic, fresh and made to order (no Pret making your sandwiches in the morning doesn’t count as ‘fresh’) for five pounds. But on to more food from Boston. On my third day of work I was asked by my boss to replace someone at a talk at MIT.It was a conference on food trucks and mobile payments (yes these exist) and while it was totally useless from a work point of view I got to find out a lot about the Boston food (and fashion) truck scene. I found out that Boston is one of the cities in America with the most food trucks per capita and I have made it my mission to try as many as I can. I started by having my leftover sandwich with some rosemary french fries from Clover – one of Boston’s most famous food truck enterprises (they have over 5 trucks and a restaurant) which has one of its trucks close to my hotel on the Boston Common. 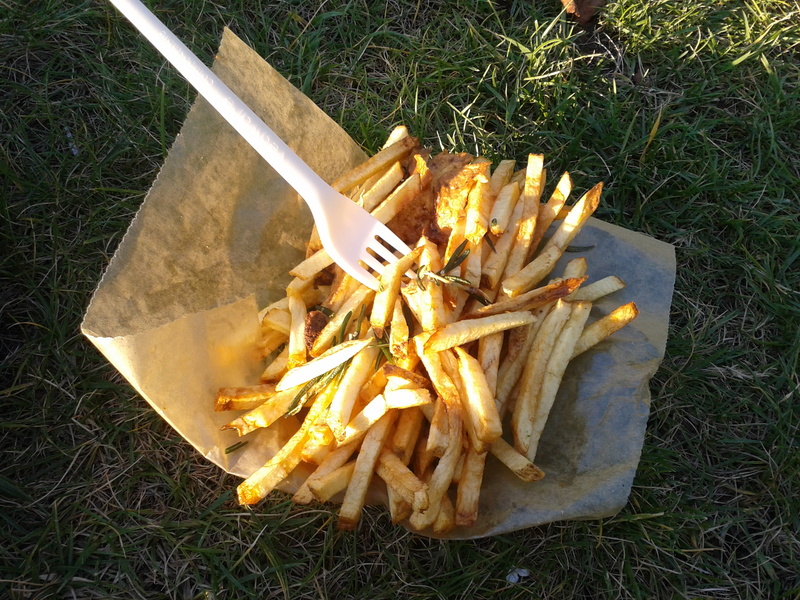 These fries were so good – crisp outside and soft inside and speckled with fried rosemary. At first I thought the rosemary was just a gimmick but then I started thinking about all the possibilities of dishes that could be sprinkled with fried rosemary – which made the herb milder than usual and very crispy. 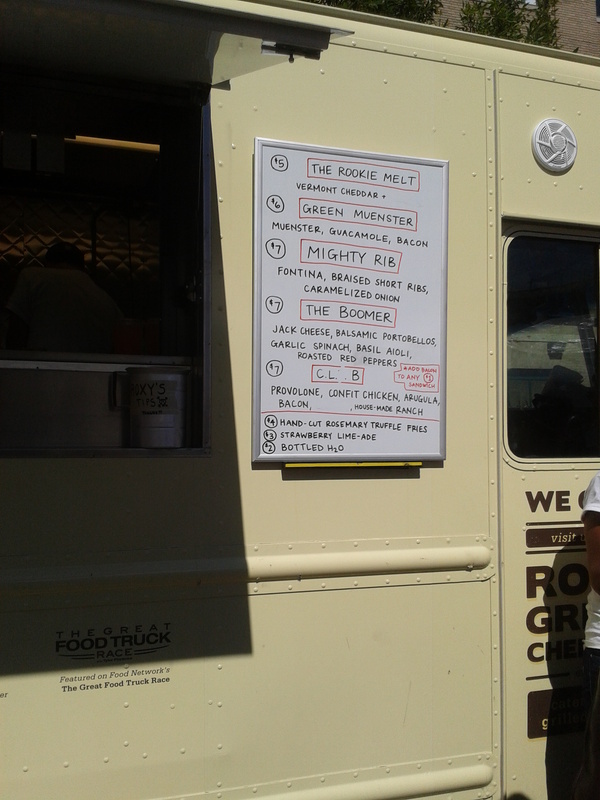 My next food truck experience was my next day’s lunch at Bon Me. Sadly I have no picture of my food so you will have to drool on this image of their menu from their Flickr page. 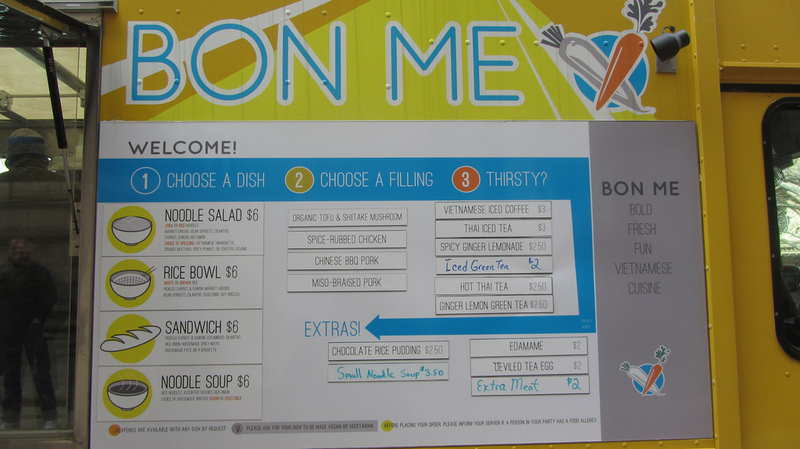 Bon Me is a Vietnamese food truck and serves three main dishes plus some extras (no more noodle soup). You choose your base then add your filling. I had the Bahn-mi with bbq pork which was incredible. Fresh bread, pork pate, punchy pickled carrot and daikon and smoky bbq pork topped with fresh coriander. This was amazing and incredible value for $6. The truck stops quite close to my work on Fridays so I will be sure to try the other options next week. Now I’m off to SoWa open market to test as many food trucks as I can. I have to thank miss meatball for actually making this review possible. Back in April she introduced me to a person who would give me a freelance job, which would then turn into a full-time job (with two weeks training in Boston) which turned the poor salted cod student into a working salted cod who can now spend more on food! I’ve been in Boston for a few days now, but due to jetlag and weird tropical weather, I have only just managed to try clam chowder (or chowda as Bostonians say) and lobster roll – Boston’s two iconic dishes. So I decided to head out to nearby Faneuil Hall and try both at Chowda, famous for its clam chowder and cheap lobster rolls. I had never tried clam chowder before so I had no point of comparison, but this was good! While it looked less than appetizing (imagine pale yellow goop) it tasted extremely fresh and fishy. It was full of clams and white fish and had a great consistency – not too thick, not too thin. As you can see I only bought a very small portion, but this was extremely filling! I could easily have done with that and a bit of bread on the side. 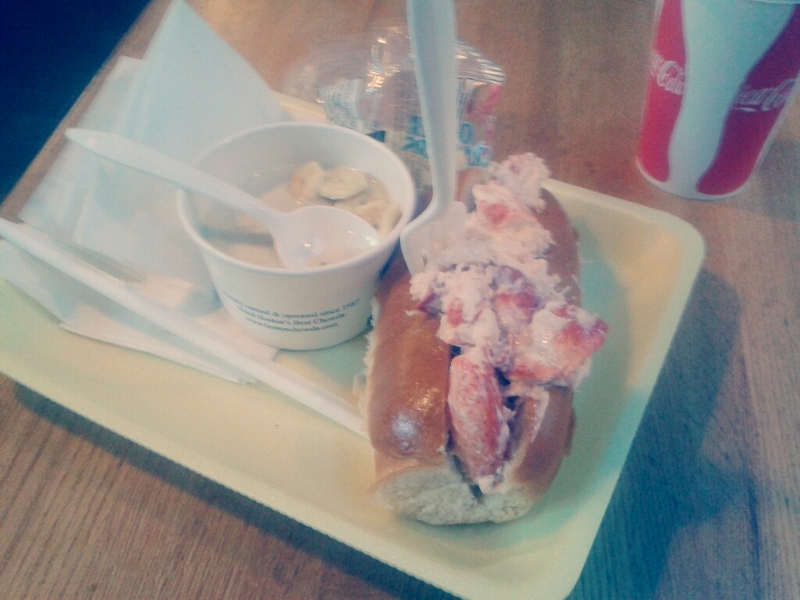 But, the temptation of a clam chowder and lobster roll combo was too much to resist and I ordered the lobster roll too. Unfortunately this paled in comparison to the chowder. I regretted it as soon as I ordered it…The lobster roll was not made to order but was actually the last one standing in a refrigerated section of the stall. I don’t know if this is simply because I came in at a time when they had run out of fresh lobster or were not busy enough for the lobster roll to be made fresh to order, but what I experienced was a very cold, too sweet lobster roll. Despite the great amount of lobster in the roll it was drowned in mayonnaise and lacked in seasoning. I ate some of the lobster and left the roll which tasted cold and old. I also have to point out to the horrible service. Having been a waitress myself I think I am allowed to be pretty strict with service. I would say that Chowda has some of the worst service I have ever experienced. Despite being empty (I came in at 5) the two people working there carried on their conversation for a good minute before attending to me. Second, the person serving me actually took a call from his phone while he was serving me. He did not try to end the call or make it brief, he was on the phone the whole time! I found this extremely rude and almost gave up on the food… but the chowder smelt too good and I was hungry. While the clam chowder was great, I am pretty sure I will not be going back to Chowda anytime soon. I had heard that Faneuil Hall was a bit of a tourist trap for food and this only confirmed it. I will be trying more lobster in the coming days and I hope it is as good as the amazing 10 pound lobster me, The Swedish Meatball and some friends had last week at Burger and Lobster.